Showing 1 results on this page out of 1 results. 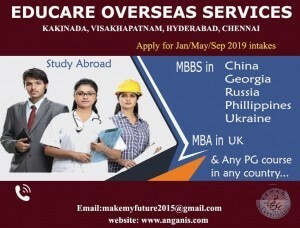 EDUCARE OVERSEAS SERVICES Study MBBS Abroad - China/Russia/Philippines Admissions Open!! Apply Now!! Limited Seats!! ELIGIBILITY: 10+2 with Physics, Chemistry & Biology.